Enjoy Braves rumors, news, talk? Is there anything to brag about concerning the Braves? With several injuries and the offense continuing to struggle, the Atlanta Braves are having a difficult time supporting their strong and consistent pitching. But the arms cannot be the only thing the Braves rely on to get into the postseason. What do the Braves need to do to get on track? Primarily, Dan Uggla needs to find a groove. Right now it doesn’t really matter what groove, I would take anything at this point. Last year he was nearly one hundred points higher in batting average and his numbers in homeruns and RBIs were double what they are now. It will also help when Jason Heyward gets healthy. Nate McClouth will be coming back too but Jordan Schafer has showing why he was such a highly touted prospect a few years ago. The young center fielder is a natural leadoff hitter and the Braves haven’t had that kind of speed at the top of the order since Rafael Furcal. 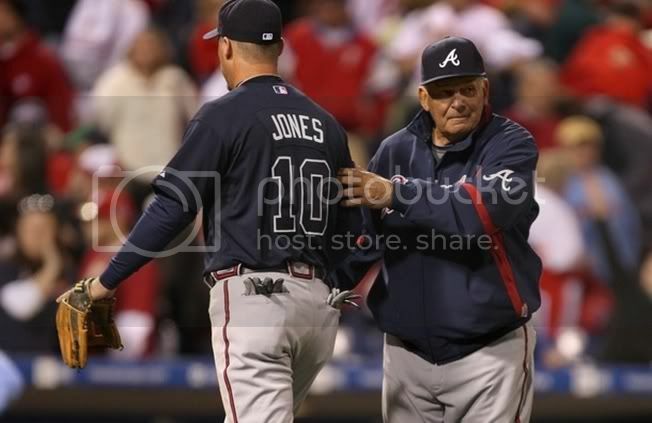 Now some may argue that the Atlanta Braves are doing really well considering their injuries and offensive woes. I would agree to an extent but a point must be made. If the Braves are doing this well (2nd place in the east and only three games behind the Phillies*) with all their troubles, imagine where the Braves would be if they were healthy and hitting the ball.